Striding into battle protected by ancient power armour a (Chaos) Space Marines can wade through a hail of incoming fire unscaved. This blessed armour increases their strength and endurance, or more correctly stated it gives the tools for this. The true source lies in their armoured backpack which contains support systems ranging from the suit’s main power plant, additional stabilizers and environmental systems. 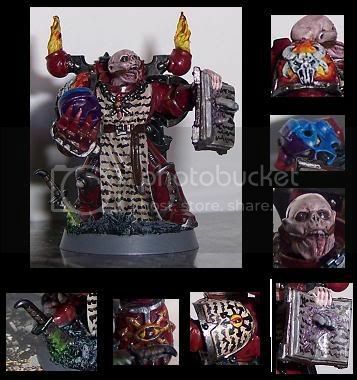 - A (Chaos) Marine backpack. - Glue and cutting tool. - One small cocktail stick per backpack. 1. 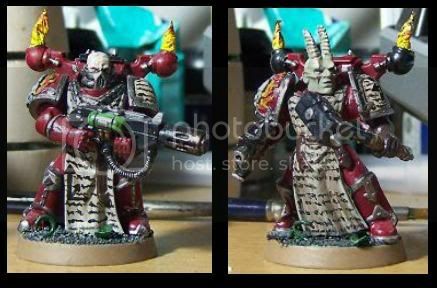 Grab yourself one basic Chaos/Space Marine backpack and take care of the standard mold line cleaning. 2. Carefully cut off the backpack’s exhaust vents. 3. Simply turn around the vents 180° and glue them right back into place. You may want to take extra time to clean the nasty mold lines on the vents. 4. Next grab some small cocktail sticks; these will serve as the basis for the backpack’s flames. 5. Cut off the tiny end of a single cocktail stick. You’ll need 2 for each backpack. 6. Another picture for scale purposes. 7. Next glue the point into the inverted exhaust vents. 8. Frontal view of the backpack and the cocktail stick positioning. 9. Grab some greenstuff (GS) and make a thin rectangular piece roughly the length of one of the cocktail sticks. 10. Gently wrap the GS round the sticks, pressing in the excess GS into the exhaust vent. In the process you’ll add extra support for the next stage – flame sculpting. 11. Leave the GS to dry for a few minutes after you’ve created the basic shape. Next use another cocktail stick and gently add the flaming details to the GS cone. All that is left now is to make a few more, add some other bits, paint and voila.....a simple, yet characterful visual addition for your army! 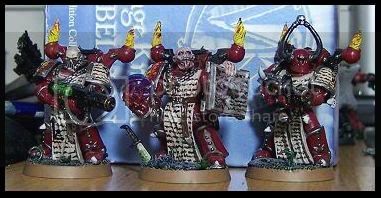 Also quite suitable for loyalists like the Black Templars and, naturally, Chaplains!